The Plastic blow molding process is a type of molding which uses air blown into malleable plastic hallow tube called a parison; like blowing up a balloon. However in the case of plastics blow molding, the plastic is restricted to the walls of the mold, also called a “tool”. This is used in products like bottles. The air continues to expand the plastic material until the void in the mold has plastic covering the entire inside of the mold. The air pressure and amount of plastic determines the thickness of the plastic bottle walls. The plastic then cools and hardens and the mold is opened up revealing the new bottle which is the exact opposite of the mold on the outside of the bottle, while the inside is the shape of the mold void less the thickness of the plastic. Left the parison is placed inside the mold, and air (green) blows it up to fit the mold, right. The result is a one piece object that is hollow where the outside of the object defines the shape and form. Microdyne Plastics makes many kinds of bottles from various plastic formulations. Custom shapes, sizes and colors can be produced with the development of appropriate molds, which is also done in-house. Microdyne also has some standard molds developed so a customer can choose the material/color and order bottles and jars without the costly tool (mold) charges. Today large production runs by automated machinery does each step automatically and can run thousands of objects every day. 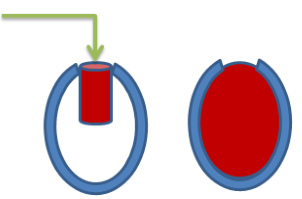 The plastic parison’s is extruded and placed in the mold automatically, the mold is closed around the parison, then the air blows it up to the shape of the mold. When cool enough, it opens up ejecting the complete bottle. Some bottles need printing (which we call decoration in the plastics industry), so they go through a printing machine which applied the design and they are ready to ship. Microdyne offers other post production services including shrink wrapping, bottle assembly or cap manufacturing, UPC labeling, and special packaging.